Adam Foulds is a British novelist and poet. His most recent books are In the Wolf's Mouth and The Broken Word, which won the Costa Poetry Award and the Somerset Maugham Award. He has recently been awarded the E. M. Forster Award by the American Academy of Arts and Letters and was named one of Granta’s Best of Young British Novelists. "Adam Foulds is one of the best British writers to emerge in the past decade. His story of [the poet] John Clare's incarceration in a Victorian lunatic asylum is subtle, highly intelligent, and rich in its understanding of the mad, the sane, and that large overlapping category in between." "What a haunting, fascinating book this is. Foulds leads us deep into a mysterious maze of history, where the demarcations of sanity are blurred, reality competes with dreams, and the truth is what any character imagines it to be." "A remarkable and passionate book. The worlds it creates, the forest and the asylum, and the characters that inhabit them are drawn with a wonderfully strange poetic intensity. It is a wholly original vision, impossible to forget." 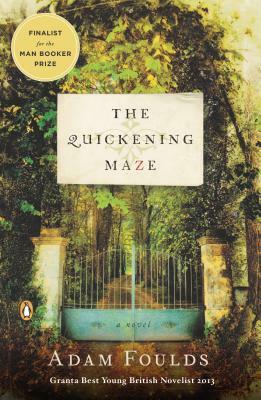 "Tender and scrupulous...what I love most about THE QUICKENING MAZE is its quietness, the silence that makes you lean in until you hear its lovely song." "Exceptional...like a lucid dream: earthy and true, but shifting, metamorphic-the word-perfect fruit of a poet's sharp eye and novelist's limber reach." "[Foulds is] one of the most interesting and talented writers of his generation." "Impressive...simultaneously poised and flowing in its urgency."